NeoPod Systems™ works closely with our clients during all phases of design and construction. Available upon request, NeoPod’s™ experts and the client can work together as a team to determine the optimal layout that maximizes efficiencies and savings. When NeoPod’s™ team is involved early in the design process, we may be able to make project design recommendations that can result in significant optimization opportunities. During this stage, we will also obtain all of the necessary finishing details for the units. 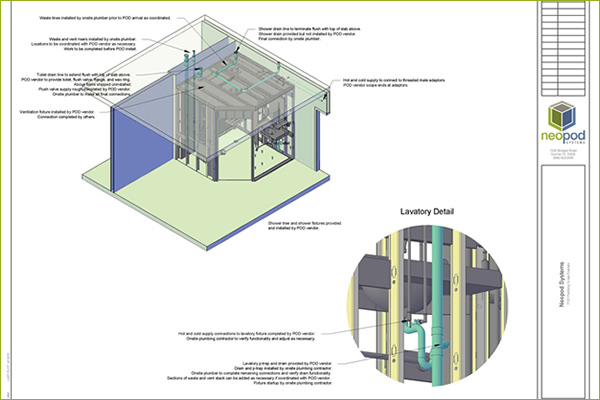 As a part of the team, NeoPod will provide BIM Modeling documents to ensure an accurate problem-free installation. Our highly skilled workforce will create a full sized prototype from the initial CAD drawings. The prototype phase is an integral part of the planning and design process. This phase allows the client to see the design come to life. Walking through a prototype, gives the design team an opportunity to make adjustments before the design is sent into full production. Once the client has approved the prototype, NeoPod™ will begin producing the pods for your job, in our state of the art facility. 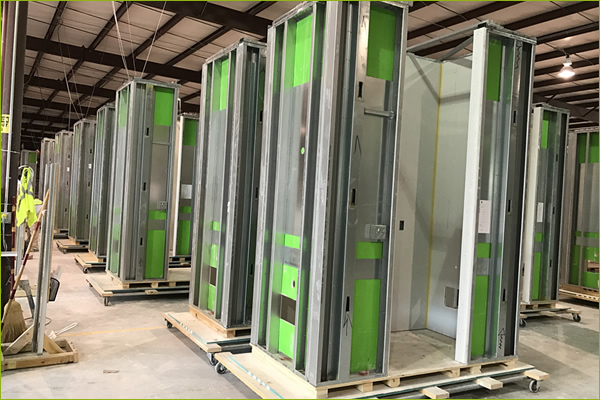 Our production line begins building your bathroom Pods generally before a single wall is built on your jobsite. Our NeoPod™ team creates your Pod starting with the walls being cut by our “state of the art” CNC Routers. The NeoPod™ CAD design team programs your design into the CNC Router to cut each and every wall precisely to your specifications. 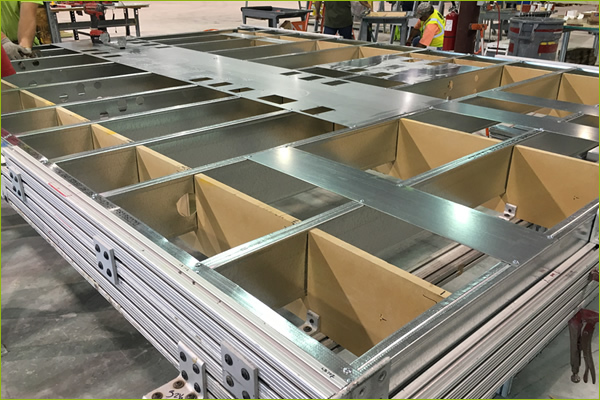 We prefab most of the major components onsite to save time and money for our clients. Walls, tape and float, painting, plumbing, electric, flooring, fixtures and all finishing touches all done at once by a NeoPod™ trained crew of specialists. Once your Pod has completed its trip through the production line, it is then inspected by our NeoPod™ QC expert and stamp “NeoPod™ Certified” and ready to ship to your jobsite. Additionally, we are certified to provide 3rd-party code compliance inspections for multiple US states, saving additional time on site where applicable. 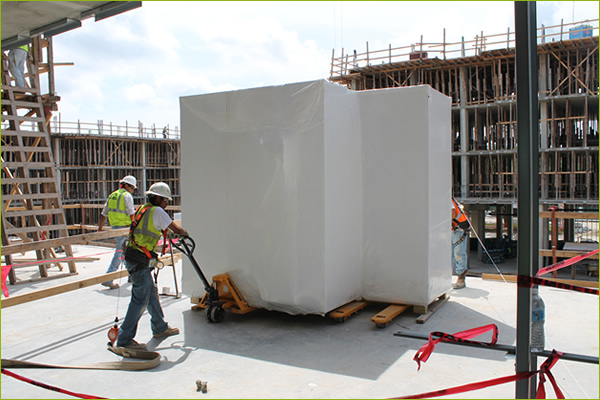 When your building is ready, your custom Pod order will be ready and waiting to be shipped. 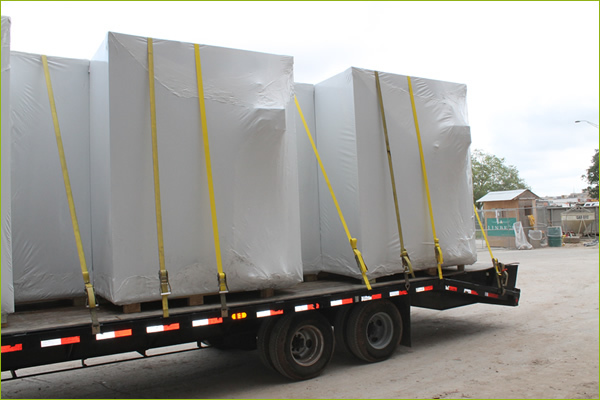 A custom delivery schedule can be created in phases to accommodate your building schedule. To ensure that your Pods arrive to you safely, NeoPod™ wraps your Pod with a heavy duty shrink wrap to protect them from the elements. NeoPod™ will ship to your jobsite by truck, train or vessel wrapped, finished and ready for installation. NeoPod™ provides all the equipment required to install our products safely and efficiently. We coordinate with the client to assist in planning requirements throughout the project to make it a stress free process. 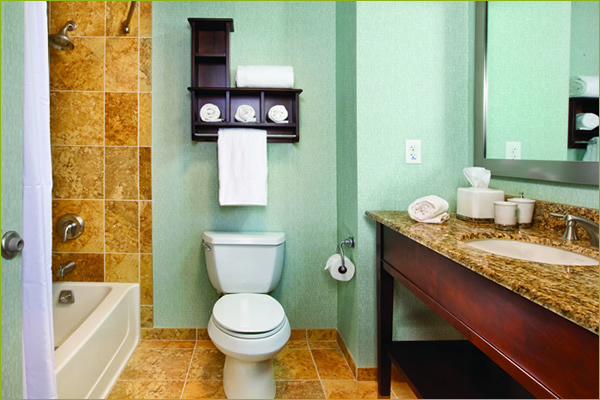 NeoPod™ has teams available to provide installation should the builder require that assistance. We always have factory personnel on site at the beginning of all installs and remain available as needed through completion. On large vertical projects, we even have the capability of installing the products into the facility after regular work hours where conditions allow, maximizing the use of jobsite cranes and hoisting systems. After the pod has been installed in its proper location and has been connected to all building systems, it is ready for local inspection of its relevant components. Once all systems have been approved, the client and a NeoPod™ project representative will inspect the pods at completion to ensure the clients satisfaction.